Greenmeadow Community Farm FarmGreenmeadow Community Farm has been a working farm for over 250 years. 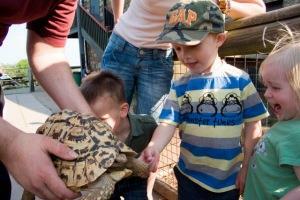 Set in over 150 acres, we have a wide range of pedigree and rare animals which you can come and meet up close. Nestled in the heart of Cwmbran, this is truly a Community Farm in every sense of the word, working closely with and serving the local community and welcoming visitors from far and wide. We have a cosy farmhouse cafe offering kids favourites and a selection of homemade specials. We aim to use as much local produce as we can, supporting local farmers, growers and suppliers. We are planning to develop the farms kitchen garden so that we can supply the cafe with fruit and vegetables grown on the farm. Our tea, coffee and sugar is Fairtrade. The farm shop is full of tractors and animals to take home after your visit to the farm. There really is something for everyone. We are forging relationships with local craftspeople and hoping to offer more locally made farm-related items in the shop. The farm is closed from Christmas Eve until 1st February. By Car - we are ideally situated, less than 5 miles from the M4. From the M4 take exit 26 heading towards Cwmbran on Malpas Road. From the roundabout at the top of Malpas Road, just follow the brown signs with the white sheep and they will bring you to us! For directions from all other locations, please click on the View Map button under our logo at the top right of this page and you can search for directions from any UK postcode. Our postcode for GPS purposes is NP44 5AJ. We are delighted to offer you free parking in our on site car park - if it is full, we also have an overflow car park, signposted at the 2nd exit from the roundabout at the main entrance. Special dietary requirements are possible but it is best to call beforehand to arrange anything specific. Most of the Farm is wheelchair accesible although some paths and the adventure playground are unsuitable. If in doubt, please call beforehand to discuss your requirements.